Are you looking to improve your child’s ability to read and write? 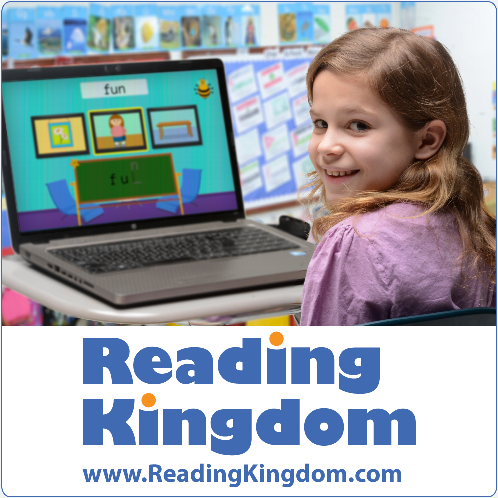 Then you might want to check out Reading Kingdom online interactive curriculum. Reading Kingdom offers a better strategy than what has traditionally been offered to help kids improve their reading and writing skills, reduce academic failure, and reach reading proficiency. Retail $19.99 month ($9.99 additional child). 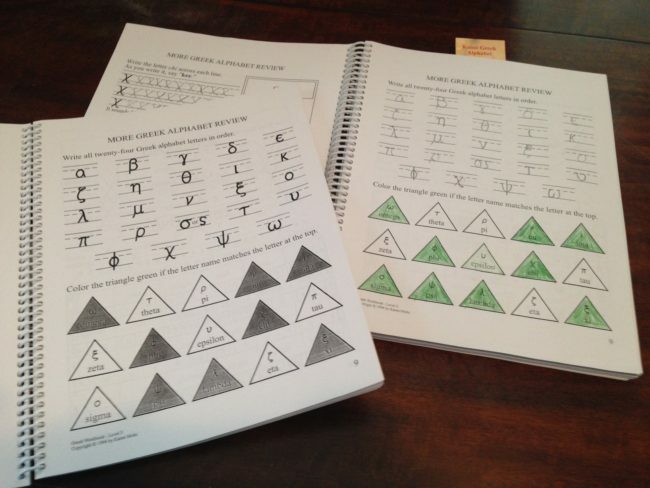 Reading Kingdom uses a patented strategy called the Phonics Plus decoding system created by Dr. Marion Blank, a developmental psychologist who is also one of the world experts on reading. 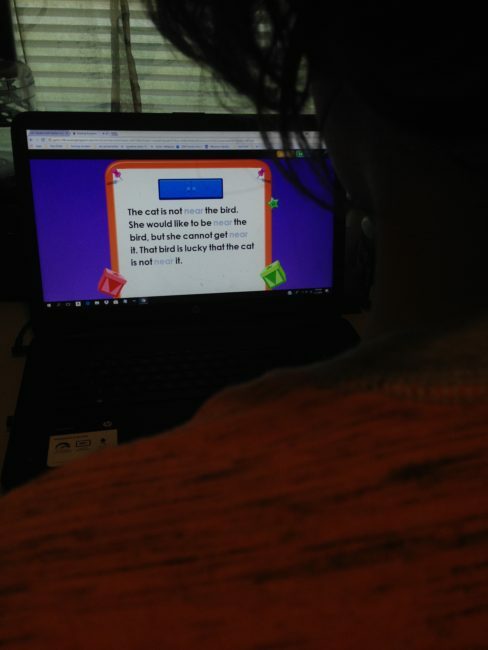 Learning with Reading Kingdom has been made available in a fun online interactive program by her son Jonathan Blank, an expert in computer software development. Now families everywhere can have access to this award winning learning system to help kids learn to read and write. 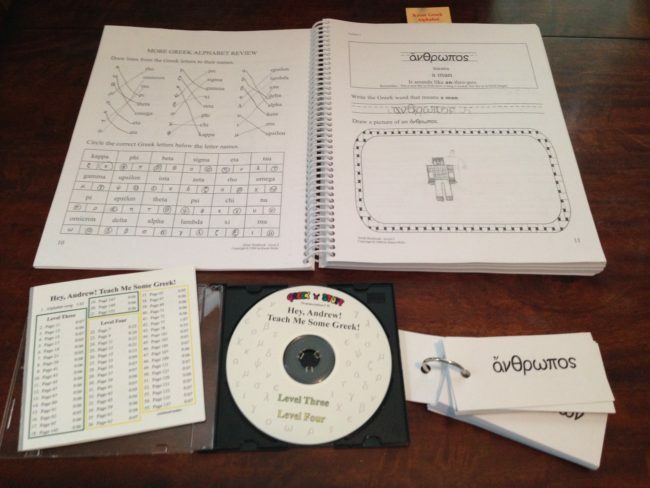 The Phonics Plus decoding system is based on learning the meanings of words, the pattern sequencing of letters, and sounds that create meaning. Sequencing: recognizing patterns from left to right. 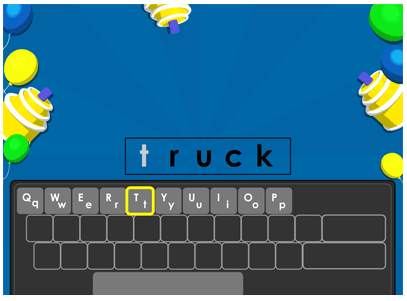 Writing: understanding letter placement on keyboard and writing through out the program. Meaning: understanding the meaning of words and their context. Comprehension: remembering and understanding what has been read. 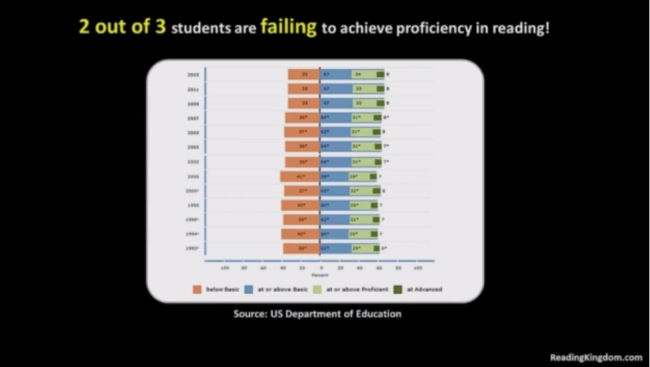 The Department of Education reports that two out of three kids today are failing at reading and writing proficiency and Dr. Blank believes it is because they learned to read with phonics only. 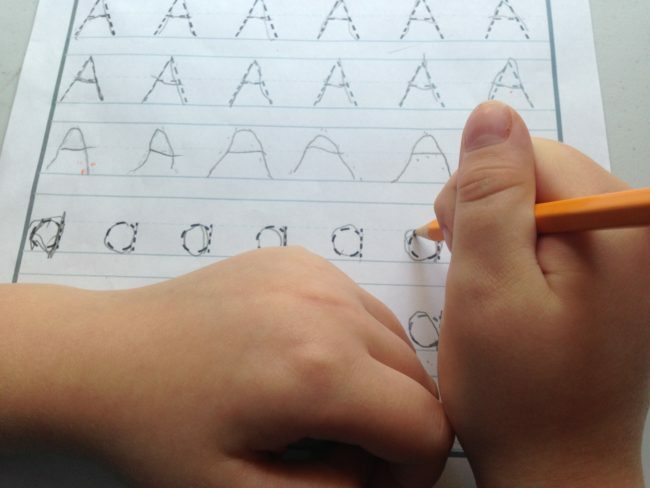 There are many reasons why learning with phonics only fails to help so many kids. However, rather than just learning phonics only, Reading Kingdom teaches the Phonic’s Plus decoding system as foundational for mastering reading and writing proficiency. This method brings reading, writing, and comprehension together. As students learn these skills, they will benefit both now and later in life as many of these skills overflow into other areas in a person’s life. Reading Kingdom uses fun reading games, story books, and the Phonics Plus decoding strategy to boost each student’s skills and confidence in reading, writing, and comprehension. 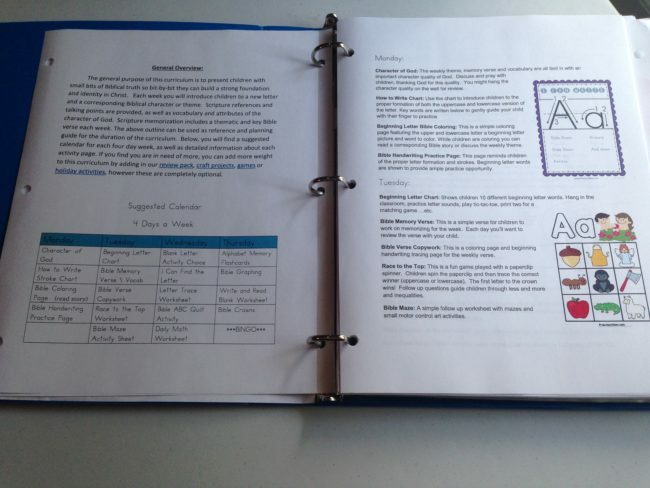 When kids finish the program, they will have mastered above a third grade reading level. Reading Kingdom contains 5 Levels. Each level is adaptable for the skill level of the person using it, so it customizes itself per the child’s needs. Each level builds upon the skills learned in the previous level. Before moving forward it gets kids ready for the next level so both sets of skill levels flow smoothly together. A Progress Check (review quiz) is given after each level. More practice is given if needed, or if they have mastered everything, they are promoted to the next level. Reading Kingdom is designed to be used 4 days per week. 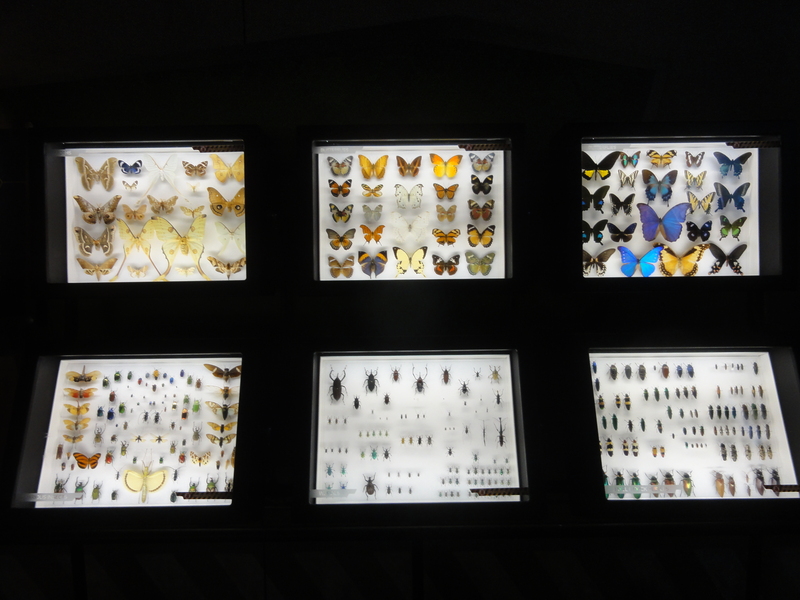 Each level is filled with several sessions and you complete one session each day. Each session takes about 10 to 20 minutes to complete. A child learns 1 new word or reads 1 new book during each session. Below are a few examples of different skill levels. 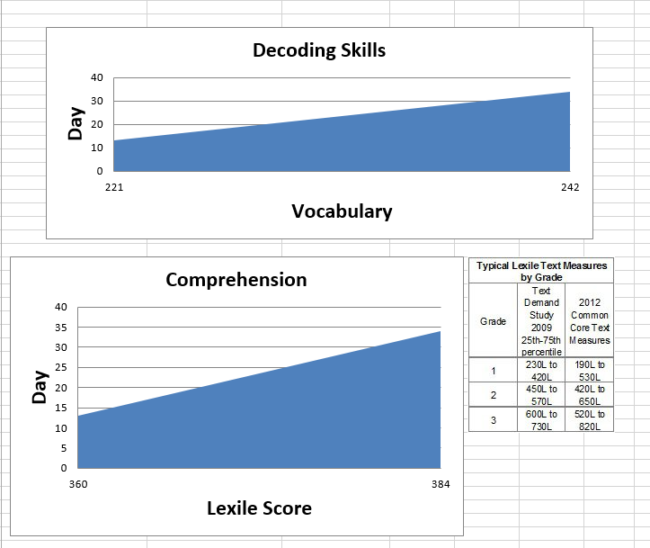 The first picture shows the level, the number of new words, new words plus word variants, total new words, and new books learned in that level. The second picture in each category below is an example of a learning game in that level. The entire Reading Kingdom online program starting at the lowest level and working your way through to completing the highest level, is designed to take about 12 to 15 months to complete all the levels and skills. However, an older child child who already has acquired some reading skills, takes the placement test and scores above the beginning level, etc. maybe able to complete the program quicker, perhaps in as little as 6+/- months. This program could also be used for review for older students and ESL and remedial learning. A child who is a struggling reader may take longer than average to complete. 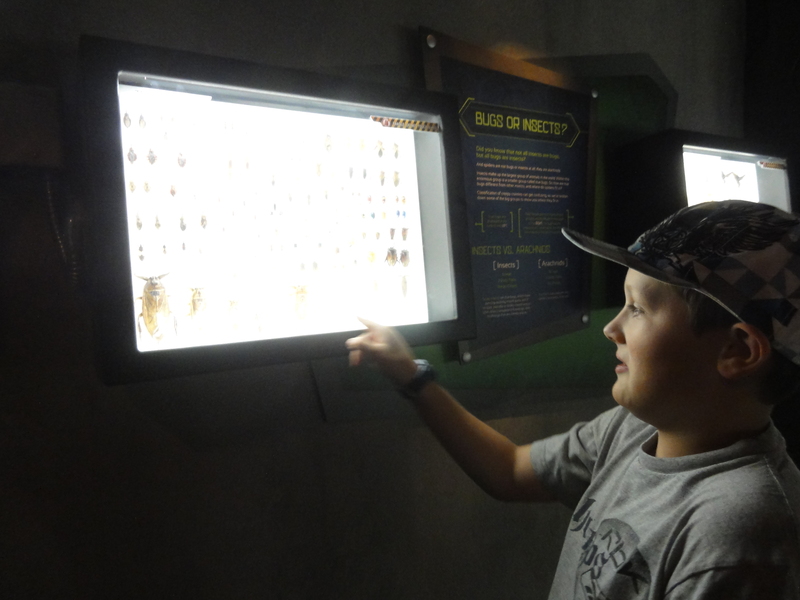 The program is flexible and adapts to the skills of each child. 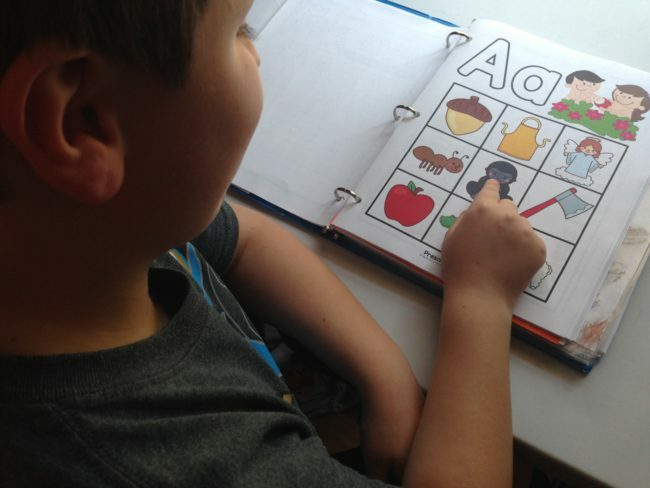 However if your student is on the Autism Spectrum or has other learning challenges, then you might want to check into another program Reading Kingdom has developed called ADS Reading. Dr. Marion Blank is known around the world as a literacy expert. She developed and directed the Light on Literacy Program. She has served on the faculty of Columbia University. She lectures around the world, and has authored several peer-reviewed articles and books. Dr. Blank has developed award winning teaching programs. She is the author of the Reading Remedy and creator of the Reading Kingdom. I was thrilled for my kids to have the opportunity to use Reading Kingdom. We were given a one year subscription in exchange for writing an honest review about our experience. 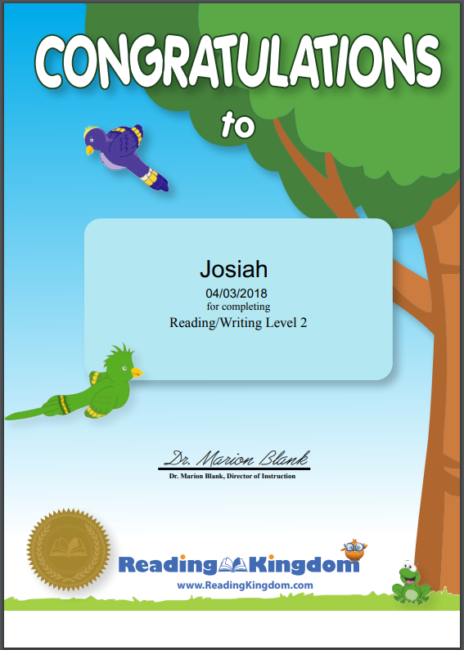 My kids have been using the Reading Kingdom program for about 6 weeks, and have practiced almost daily during our language arts study time since getting the program. 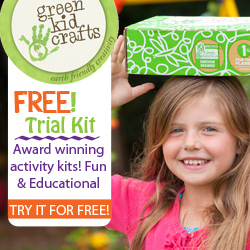 I am using this program with my three youngest kids, ages 6, 8, and 10. The 8 year old is the most consistent user. He has averaged 4.3 days per week. The 10 year old has averaged 3 days per week. 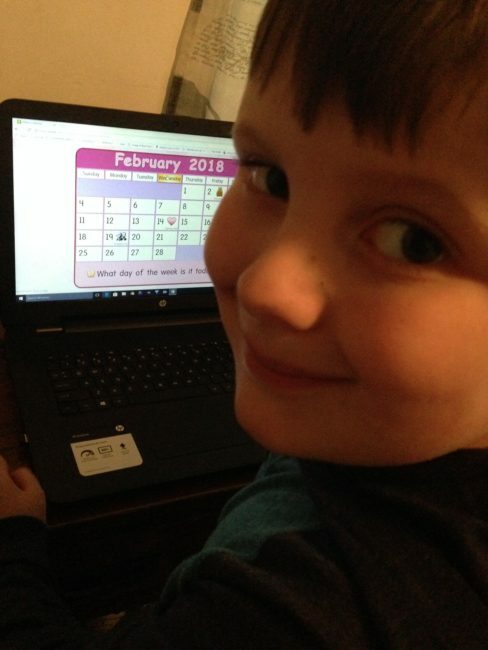 The 6 year old has an average of 2.3 days per week. Sometimes the 6 year old isn’t as motivated as the 8 year old and 10 year old are to sit at the computer. I think he has stopped a few times before his lesson was completely finished for the day, and I am not sure if that reduces the average number of days counted. I think he will become more motivated to finish each lesson as he gains more skills. This is our second time to use this program and I can see similarities in the ages in regards to skills and motivation. We had a subscription to Reading Kingdom three years ago and the kids learned a lot at that time and loved it. We were excited to see how much they have improved since then. Each child has two options when starting the program. 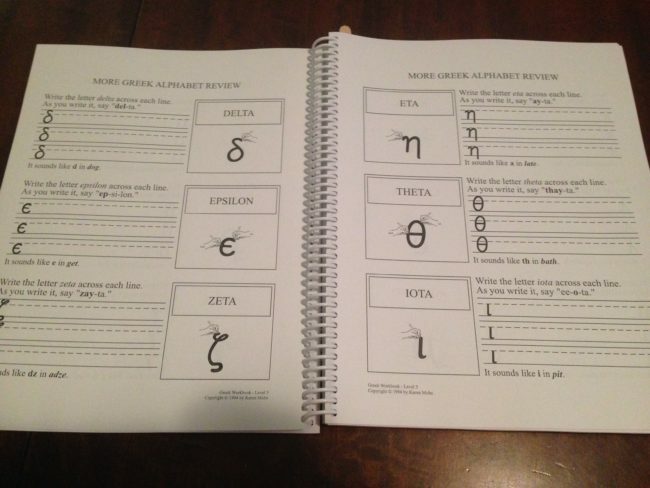 The first option is for those starting at the beginning level and are just learning to read. They can start at the very beginning with the very first lesson session. The second option is to take a placement test to find out what skills the child already knows and where they should be placed. 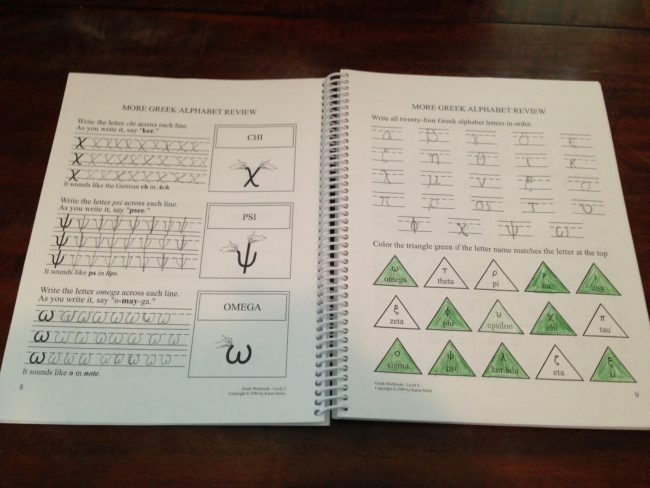 The placement test has two parts, a keyboard typing test and a sequencing test. 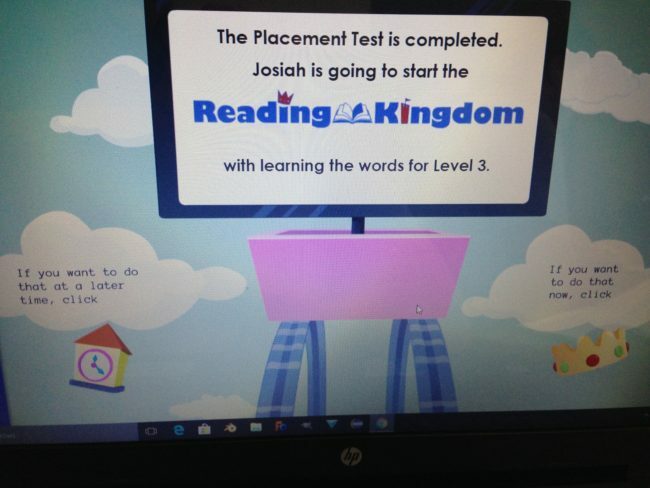 These placement tests help the parent, and the Reading Kingdom program understand what skills the student already knows, and what skills they have yet to learn. Because Reading Kingdom is an adaptable reading program, it responds to the child’s skill level and their ongoing progress. It also recognizes what they don’t know because of the mistakes they are making, and provides extra support and training in those areas. 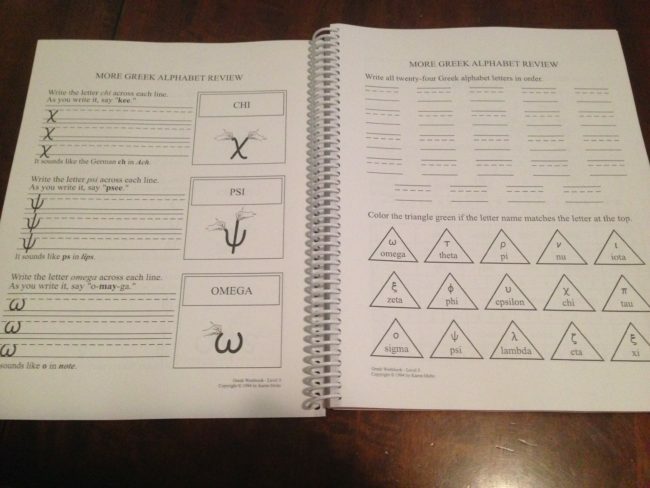 This helps customize the program to their learning level. 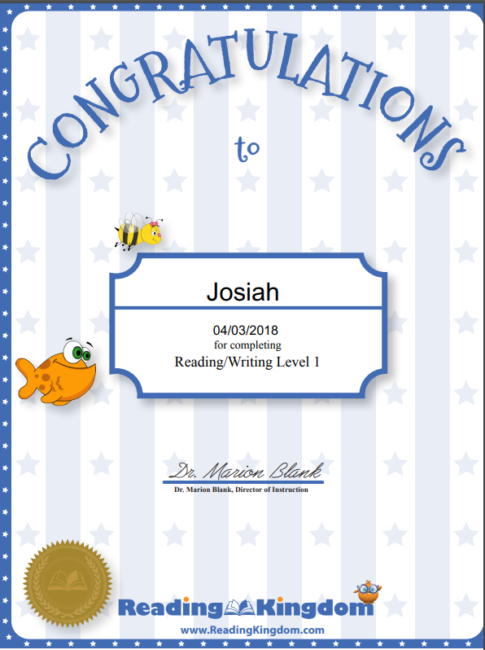 Since he is a beginning reader, I had my 6 year old start at the beginning level without taking the placement tests. My 8 year old son and 10 year old daughter both took the placement test. They took the letter sequencing test and a keyboard typing test. 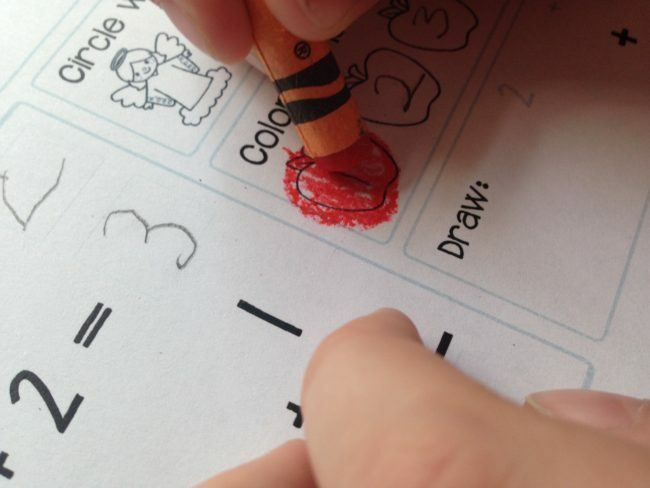 The placement test put the 8 year old a little above where I thought it would. 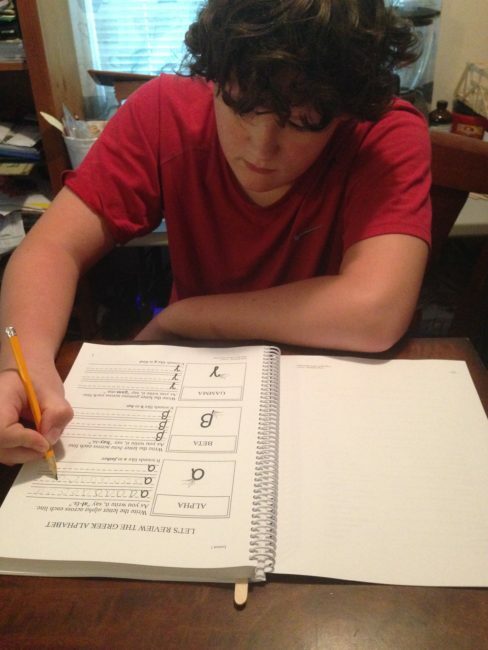 He is a strong reader and quick learner and did well on the placement test. It placed him on Level 3. However the 10 year old struggled more while taking the test, as it is timed and she is slower to answer even if she knows the answer, and it started her in the middle of Level 1. Both she and I thought she would place on a higher level. It seem to us that because she struggled with speed on the placement test is the reason why she started at a lower level, and not because she didn’t know the answer. 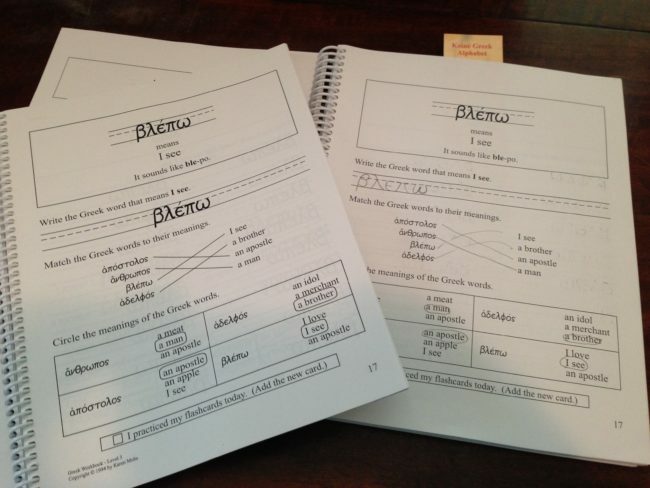 Though she was a bit disappointed at first, it has turned out to be good review for her to go back over many of the words and practice them, and the parent report is showing she is getting an “excellent” score on her lesson sessions. After the tests, and placement, then each kid can begin their sessions. The program is set up to do 1 session a day, though you can do more. After they log in, each of my kids have a dash board that shows their progress. On the parent dashboard, I can go in to a tab and choose to review reports, change the level or speed for responses, or even set it to retake the test if needed. For now, I have left everything at the default speed and mainly use my dashboard to review the reports. 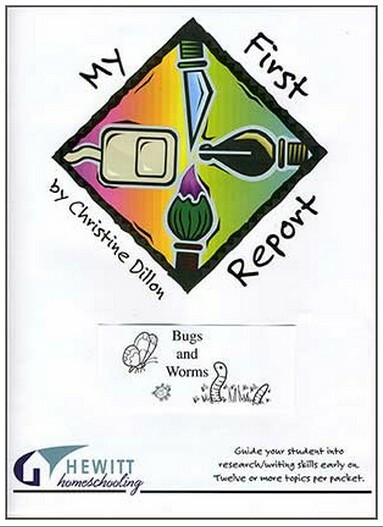 Reports can also be downloaded and sent by email too. 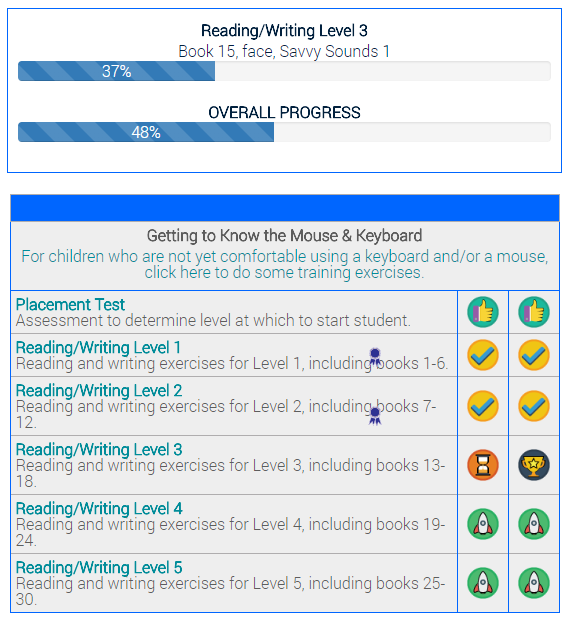 I like the parent dashboard because it gives me a basic summary of how each child is progressing, what words they are learning and what words they are struggling with. As a parent, I know each of my kids learn differently, some are fast and some are slow at picking up certain skills. 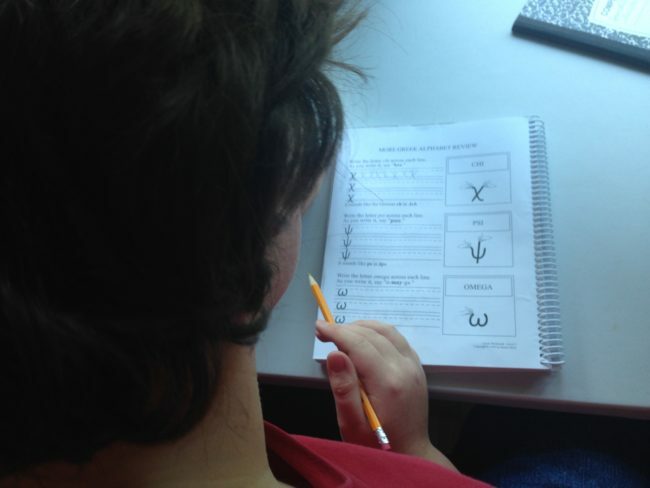 It is nice to have a curriculum that can adapt to their learning styles. When my kids complete a level (or test out of a level) they have the option to print a diploma certificate for that level. 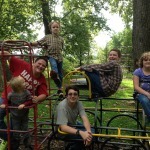 I would encourage other homeschool families to check out Reading Kingdom. You can help your child achieve reading proficiency when you team up with Reading Kingdom for the Phonics Plus solution to help your child succeed. 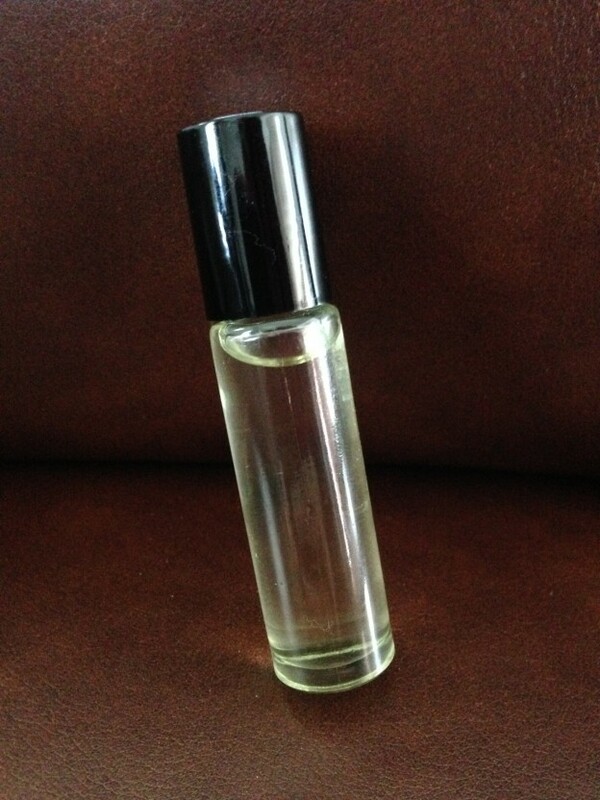 Try before you buy with FREE Sample Lessons. Reading Kingdom also offers a FREE Trial Offer, free worksheets, and many other free resources too. They also have special discount offers to choose from when you subscribe. Follow Reading Kingdom on their social media links for all the latest news, teaching ideas, product updates, and special offers. 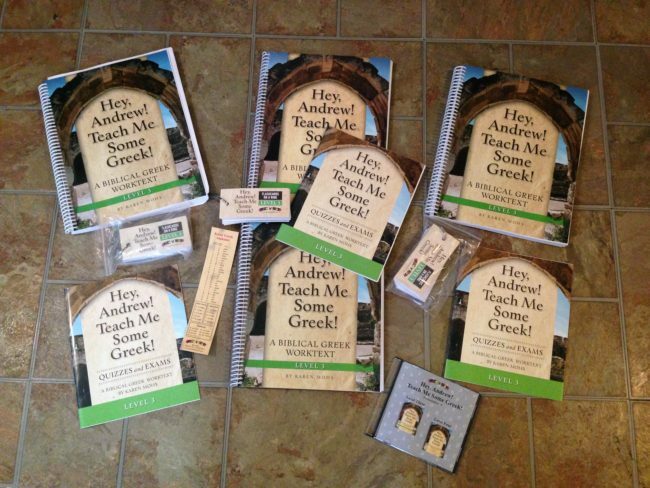 Be sure to check out what other members of the Homeschool Review Crew had to say about using products from Reading Kingdom. 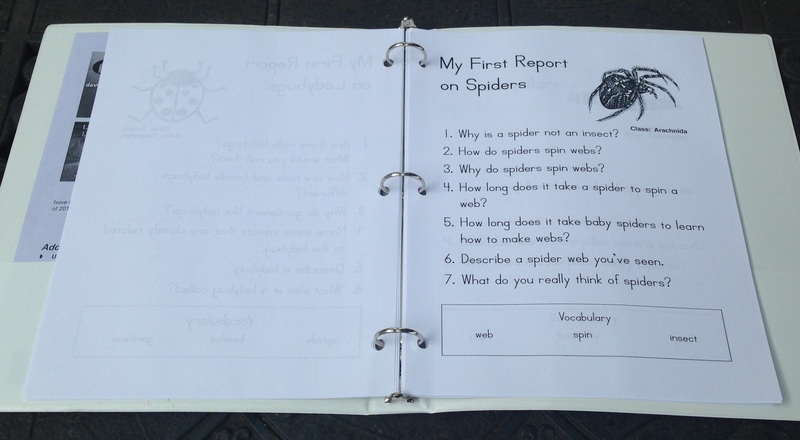 This entry was posted in Reading Kingdom, TOS Crew Reviews and tagged comprehension, first grade reading, homeschool, kindergarten, language arts, learn to read, Literacy, phonics, reading, reading comprehension, reading curriculum, reading kingdom, second grade reading, third grade reading, third grade reading comprehension on May 9, 2018 by Melinda Weiser. 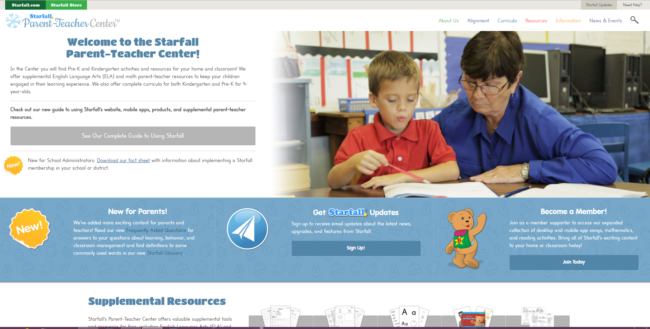 Have you ever checked out the the Starfall Education Foundation website? It has a lot of learning fun to offer! We were recently given a one year subscription to their upgraded paid version called The Starfall Home Membership in exchange for writing an honest review of our experience. The Starfall Home Membership subscription includes free mobile App to access the membership account from a mobile device. 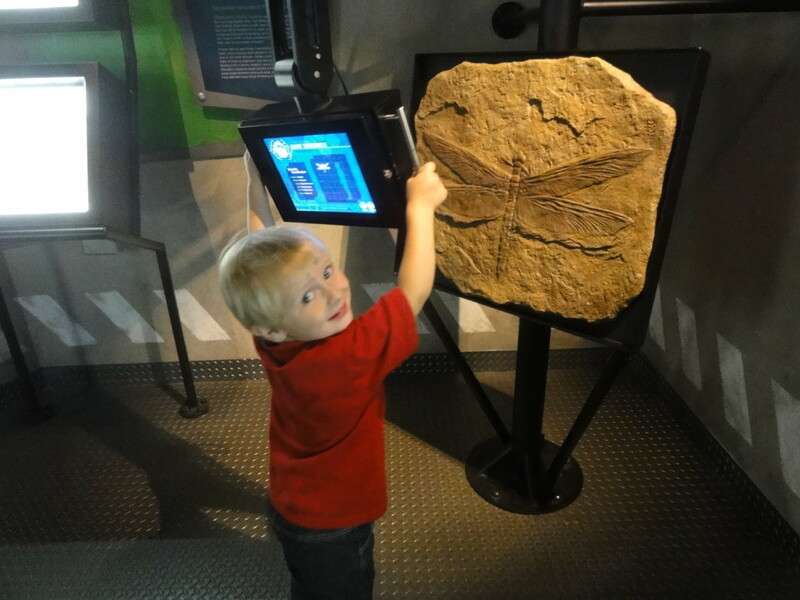 The Starfall Home Membership is an educational program for younger kids. It is designed for kids in PreK through 2nd grade. It is also great for kids (or adults) of any age who are learning English As A Second Language, any age with Special Needs, or even older kids who need Remedial work, or to just for fun to brush up on some of the basic phonics, reading, and math skills. 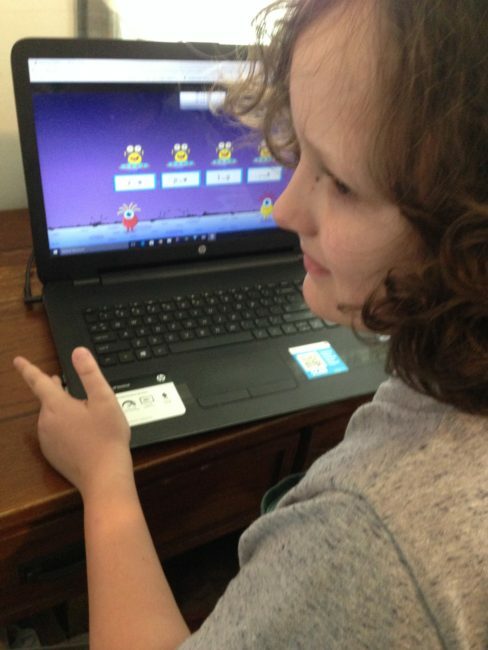 Starfall Education Foundation offers both a free version and a paid version (The Starfall Home Membership) of their online program that is filled with supplemental educational learning games. 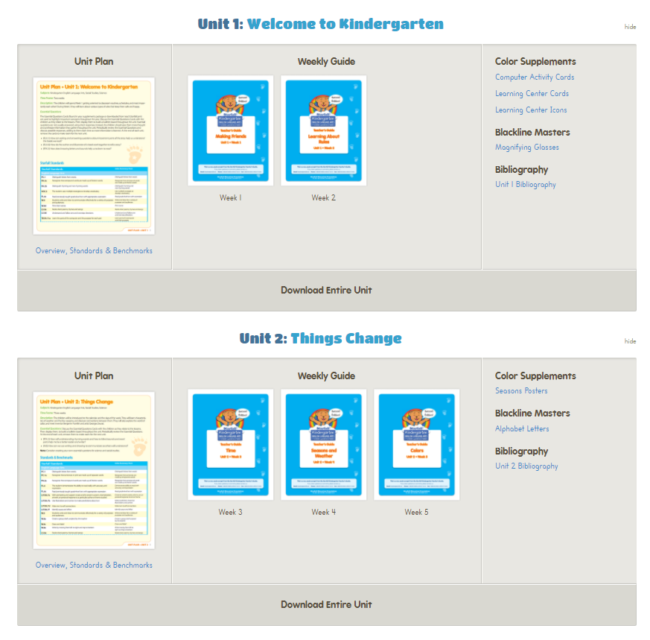 They also offer a FREE mobile app, a printed version of full curriculum for sale and other resources for sale, and FREE parent teacher resources including FREE worksheet generators, posters, books, and other free printables. Requirements to use the program are access to Internet service, and a computer or a laptop or mobile internet compatible device to access the program. 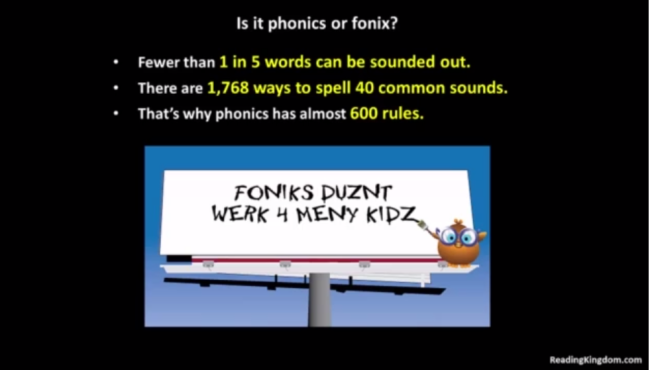 Check out this video for a short demonstration of a phonics spelling game from the Starfall Education Foundation. Here is an example of a fun math game. To see it in action, click the “play button” on this video for a short demonstration. Looking through the Parent – Teacher Center can help give parents ideas on how to use the program and incorporate the program into their student’s curriculum. 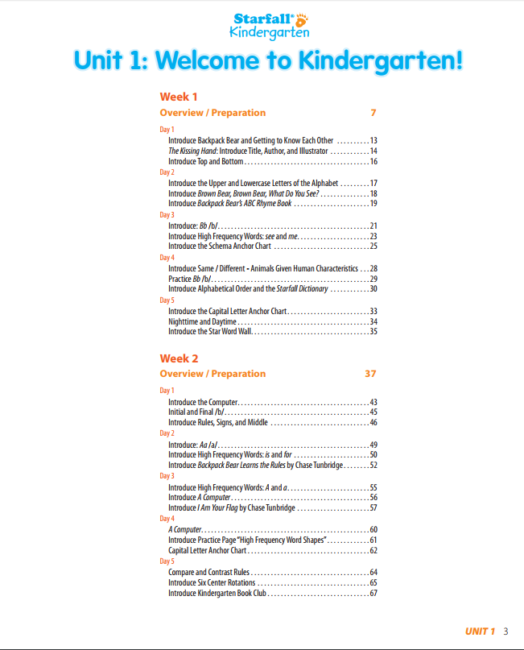 It includes supplemental worksheets, custom worksheets, posters, curriculum downloads, informative guides, and the latest information from Starfall to keep you up to date. 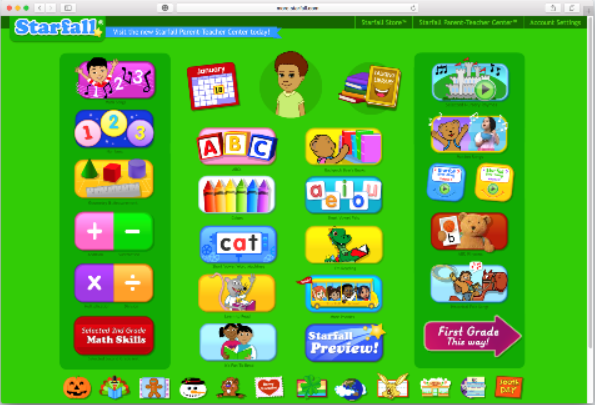 Starfall also offers an organized lesson plan already put together. You can use this resource online, or purchase the printed curriculum. 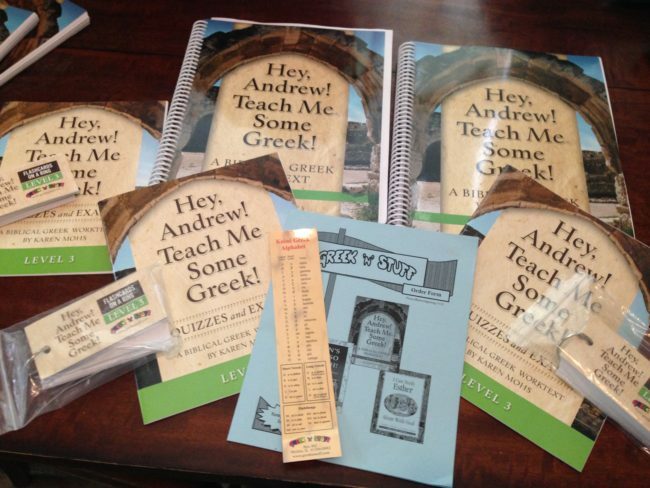 They offer a full printed curriculum that comes boxed with several additional extras (books, games, toys, manipulatives) that go along with the curriculum too. Be sure to check out their curriculum if you are looking for a helpful resource. 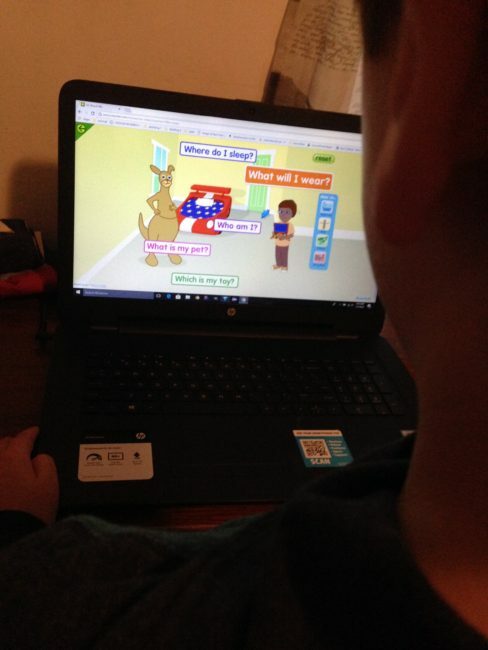 I used The Starfall Home Membership with both my six year old and nine year old sons. Though they had to share the same dashboard (as families are only given one account), each boy enjoyed different aspects of the program. 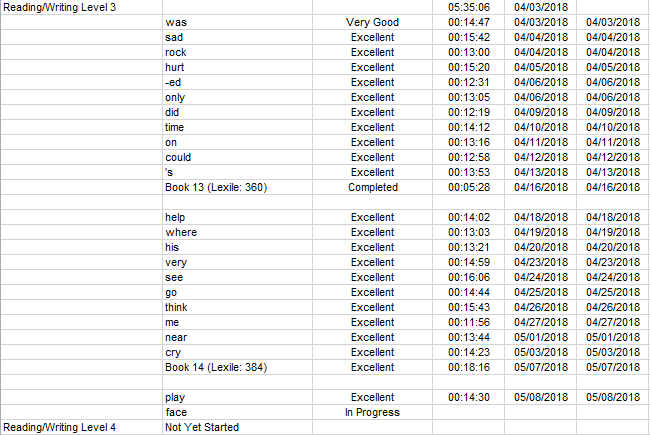 We worked on this review of Starfall during January and February. It is accessible 24/7 and we used it on weekdays as a supplement to our curriculum and weekends if the kids requested to play on it. The first thing the kids did each day they worked on the program was view the interactive calendar. This was a fun exercise to see and learn more about the days and months. The calendar lists the main holidays each month, and then you can add items, such as students can dress it up with the provided border options and stamps or print and color it. My boys changed the border for the holiday and marked the weekends stamped with stars. The calendar feature also asks the kids a few questions about what day of the week and other questions that helps them get familiar with reading and using the calendar. Another fun personalizing feature of Starfall is the avatar. Because there is only one account per household, there is only one avatar to share. 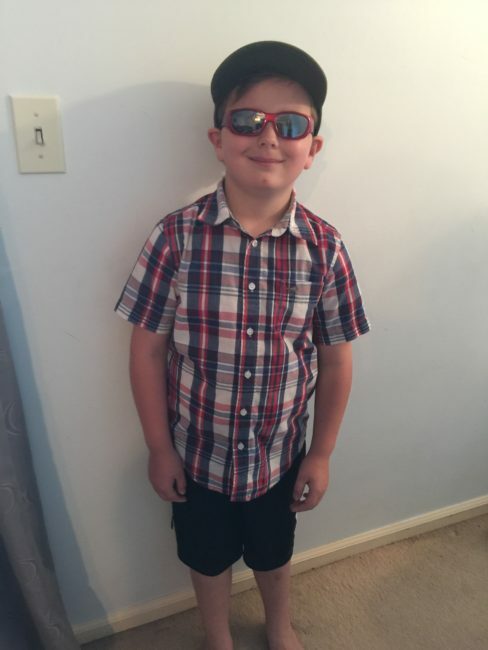 The six year old got to choose the avatar features and dress it up and then both boys worked together on answering the questions about items in the room or various rooms of the house. A nice feature of Starfall is the dashboard filled to the brim with learning opportunities. The Learn To Read tab is really nice. 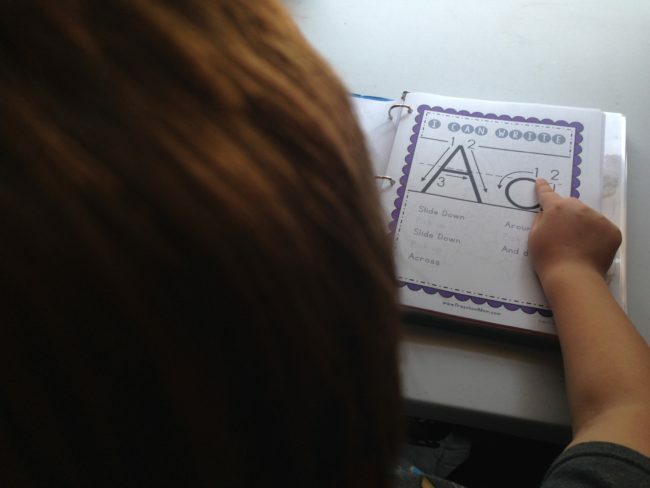 It brings you to a list of letters, words, or combinations, and then after those skills are mastered, the student proceeds to the books that feature those letters or word combinations for more practice. 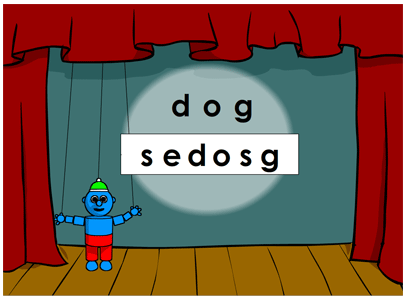 The six year old is learning letter sounds and using them in short words. He is also counting to 20 and using simple math such as adding numbers. Math songs help him remember different concepts. 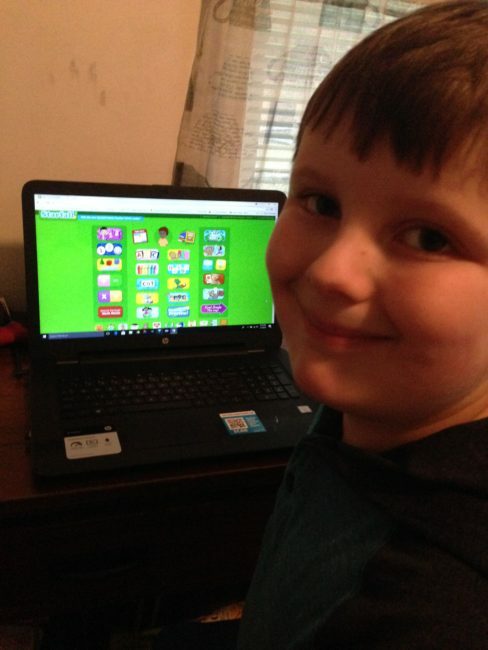 Starfall offers lots of math games that make learning math concepts fun and motivate him to want to do more fun practice of skills. There are plenty of activities to choose from. I am just barely skimming the surface in sharing these things so far. There are also puzzles, activities with subject themes, and some basic learning games in Sign Language such as the ALS alphebet and some signing words in the music activities too. My nine year old son is a strong reader already and really enjoys reading books. Here are a few pictures from some of his activities, books, songs, and learning games he has been working on. 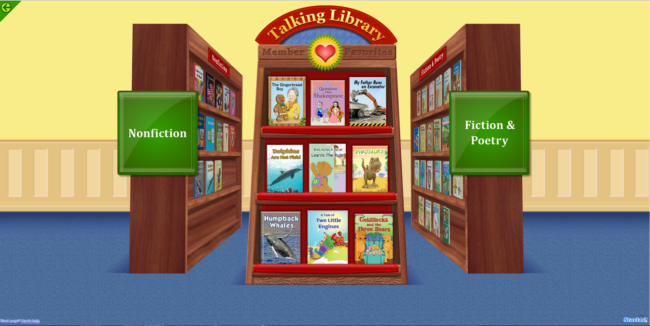 A nice feature for strong readers and those just learning to read is the option for the book to be read aloud to you. My older son did not need this feature, but my younger son did. Sometimes after my older son read the page, I would go back through it with him and push on the little ear button to have the sentence or paragraph read to him. He was like “Mom, I already read that!” However, even though he did a good job reading, I wanted him to hear the deflection in the reader’s voice as it read through the different characters and with different emotions. 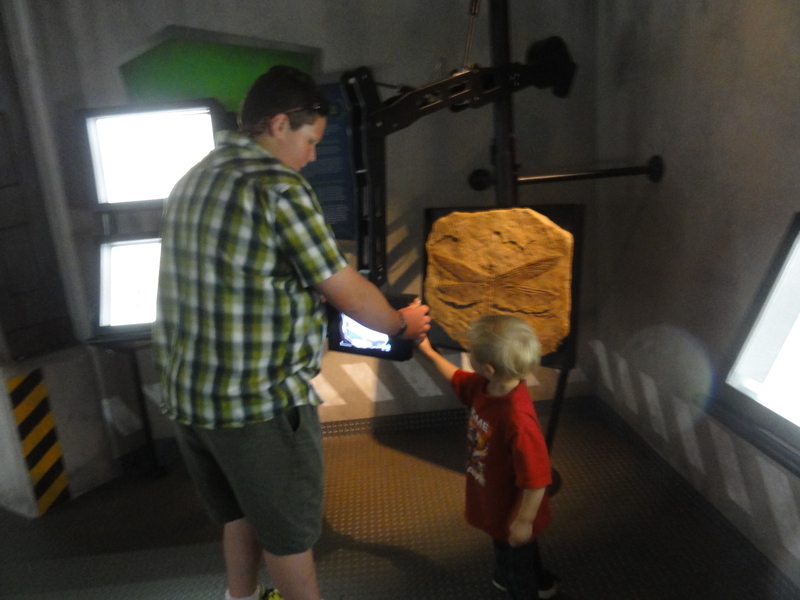 Learning how to express emotions and vary the sounds enhanced the learning for him. Every option, whether it was phonics, books, math, music etc had even more opportunities for him to read. 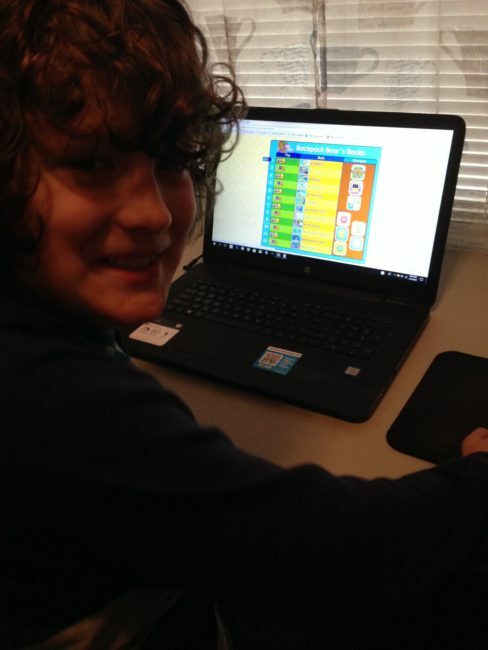 He is enjoying the various math games. There are a lot of musical options too. 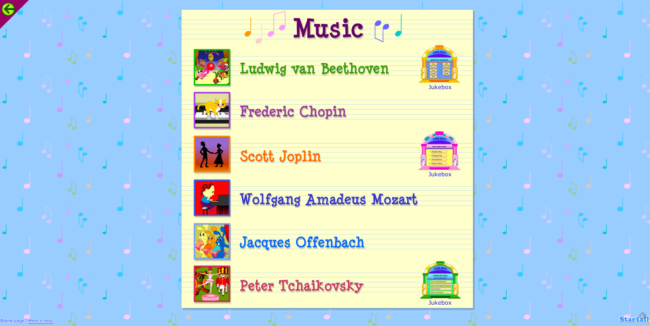 There are folk songs, nursery rhymes, math songs, abc songs, classical composers, and more. There are lots of extra learning activities too such as holiday cards, and more. 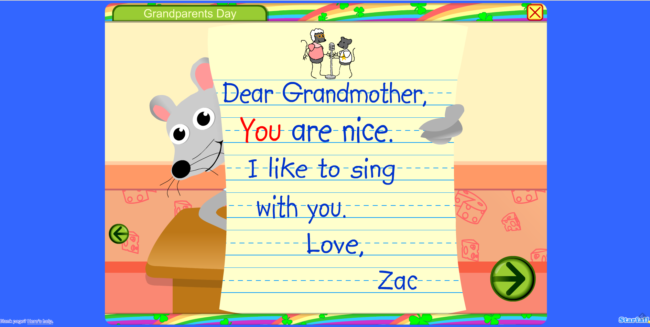 In one of the activities, my son helped a mouse practice writing a letter to his grandma. This program has a lot of activities to offer and can help kids learn and improve their reading and math skills. It is affordable at just $35 a year for the entire family, so if you have multiple younger children, you only have to pay one low price and they can all use it. You can try out the free version and see how it works for your family. The paid version offers a whole lot more. 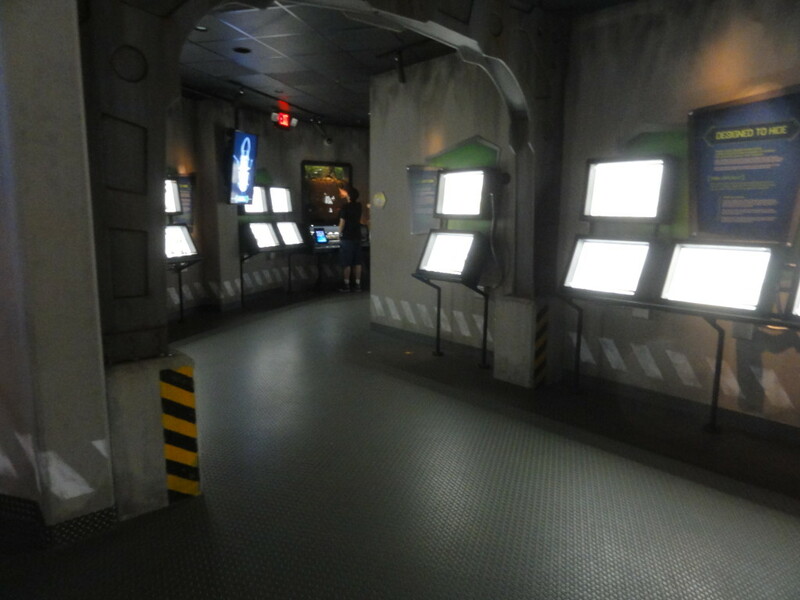 Also it does not keep scores after the activity, and kids can repeat the activity as many times as they want. You can take it on the go with you by using the mobile app so it can give kids something fun to do while traveling in the car or when “waiting” on appointments or waiting for other activities to begin. It is flexible and my younger kids have enjoyed using different parts of the program. I would have loved to have had this program when I was teaching English as a Second Language to International college students. A program like this would have helped immerse the International students in the English language and engage them with fun activities, songs, and audio visual interaction. The read aloud option of the books, with emphasis on tones and expression would have really helped practice speaking and understanding language and how it is applied in conversation and different situations. One consideration to keep in mind for religious homeschools, and especially Christian families, is that there are themes in the books and games options (such as aliens, fantasy, dragons, magic, Halloween, etc) that would be part of public school education, but may conflict with bible teaching and a homeschool with a Christian worldview. However, each activity is optional and you can choose which games or books you want to use in the program and avoid selecting certain topics that do not agree with your religious beliefs and cultural practices. The program is flexible and has many different options and you can use what you want from it. 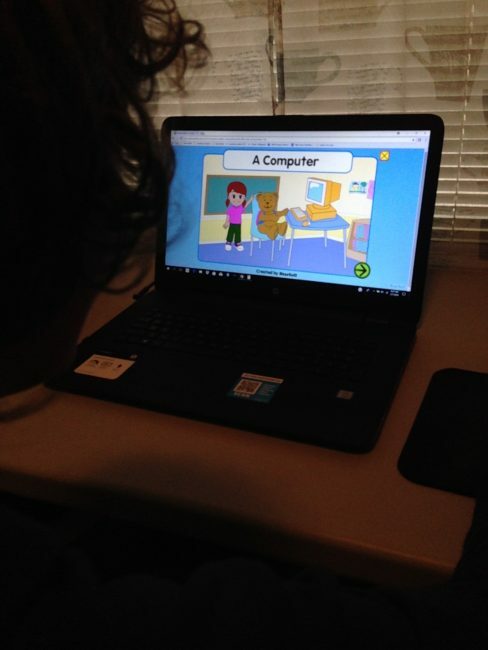 Starfall learning games and books are interactive and engaging and the program has a lot of different things to choose from to build skills and practice reading and math. It is a publicly supported non-profit educational foundation, and it’s standards are aligned with the public school Core Curriculum of both European Union and USA and other countries. Be sure to check out what others on the Homeschool Review Crew had to say about using The Starfall Home Membership in their home. 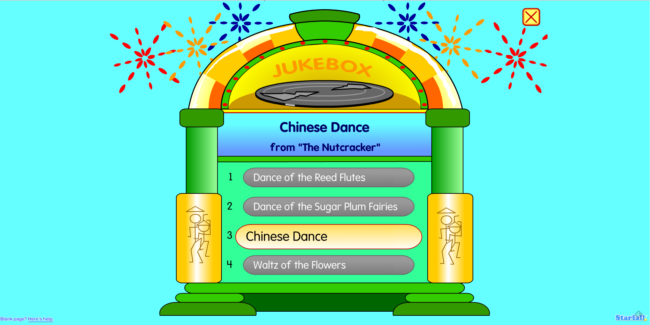 This entry was posted in Starfall, TOS Crew Reviews and tagged abc, Elementary Math, ESL, homeschool, kids educational games, kindergarten, kindergarten curriculum, learn to read, learning games, Math, phonics, phonics games, pre-k, pre-k curriculum, preschool, starfall on February 28, 2018 by Melinda Weiser. 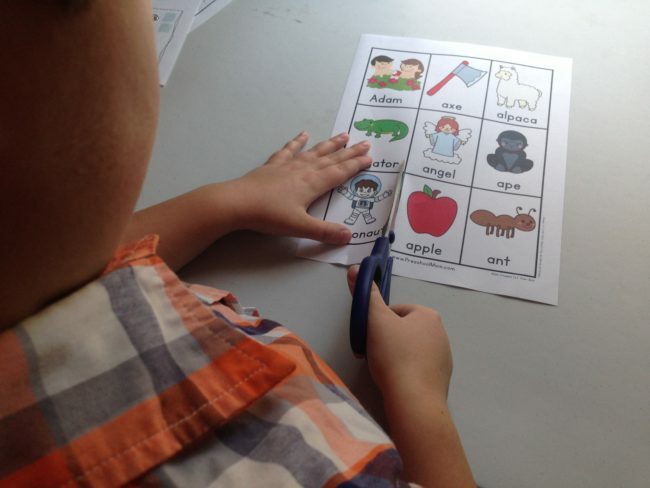 We have a fun and easy to use preschool curriculum to tell you about today from The Crafty Classroom. 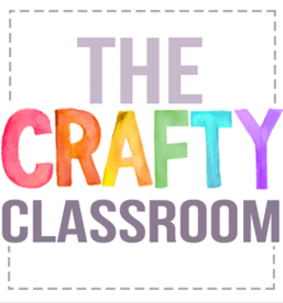 The Crafty Classroom has lots of affordable printable curriculum options for kids of all ages. 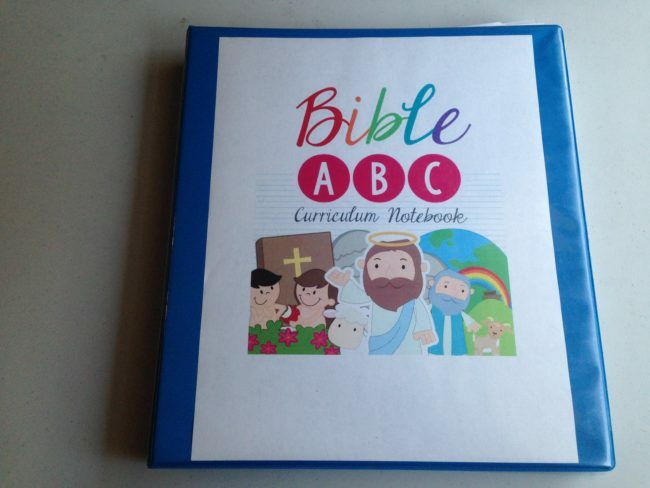 We are currently reviewing their Bible ABC Curriculum Notebook. This product has made teaching preschool super fun and easy in our home. This downloadable curriculum includes everything you and your student need to hit the ground running. 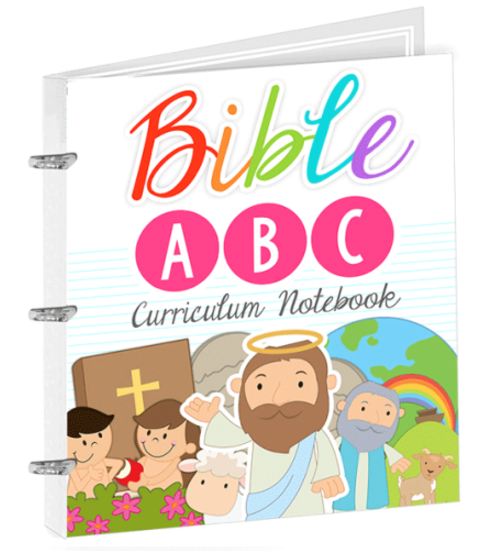 The Bible ABC Curriculum Notebook is 658 printable pages on a PDF downloadable file. 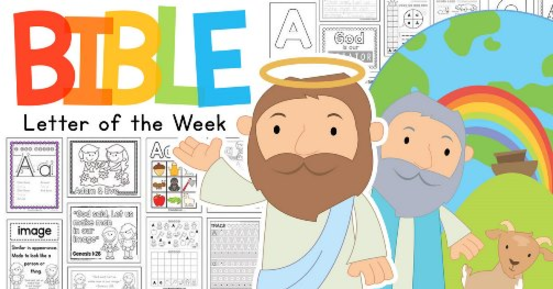 It contains lots of illustrated full color (and black and white) downloadable materials that are great for teaching children the alphabet and teaching them verses from the bible while they grow in their faith in God. 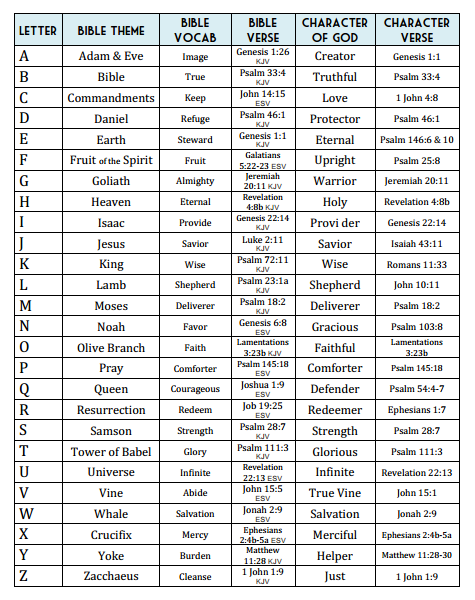 The focus of this curriculum is to help kids learn their ABC’s and biblical truths at the same time. By giving kids biblical truths in small pieces each day, it helps kids build a strong foundation and identity in Christ. Each week students learn a new letter, a character quality of Father God, and a corresponding bible verse as they grow in their knowledge of him and build their faith. This curriculum is designed to keep the prep work to a minimum. Good news! 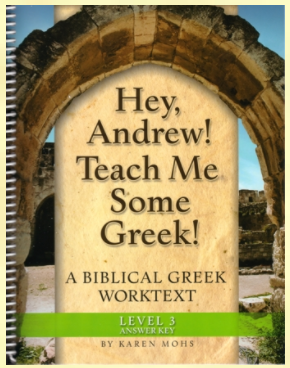 All you need to complete this course is the printed out worksheets for the day (or the week), a bible, a pencil and crayons. For a couple activities you will also need glue, scissors, and a ruler. That is it! This curriculum is designed to keep the prep work and organization for the teacher to a minimum. 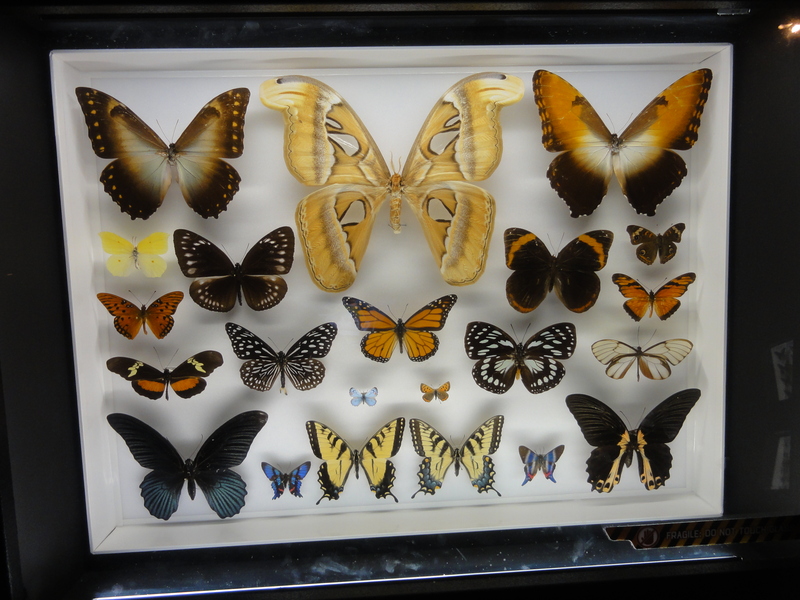 You can store everything you need in 1 binder (large sized) and a zippered pencil case. You can also add dividers into your binder for each letter if you want to. It is suggested to teach this material 4 days a week during a 26 week course. 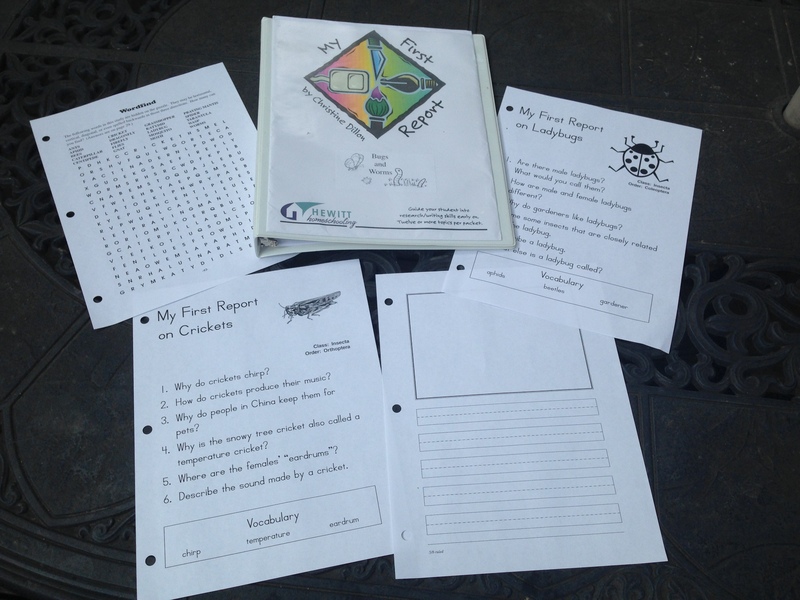 Each day there are 4 to 5 worksheets for your student to complete. The suggested age range is Preschool to K4, but K5 and possibly first graders might benefit from going over this curriculum too. 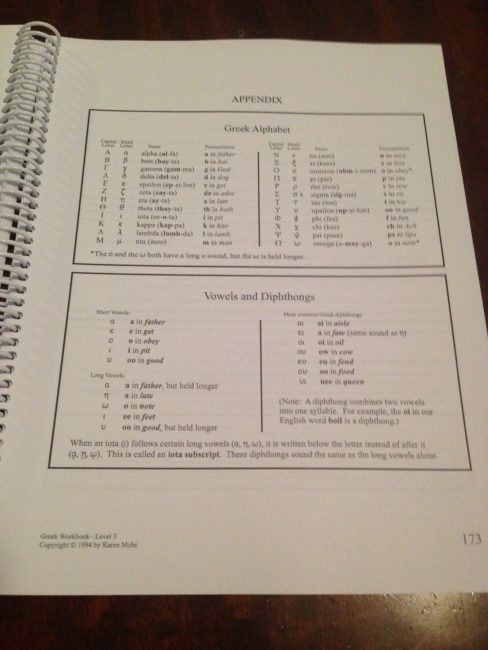 This curriculum would also be a great way to introduce ESL students to the English language too. 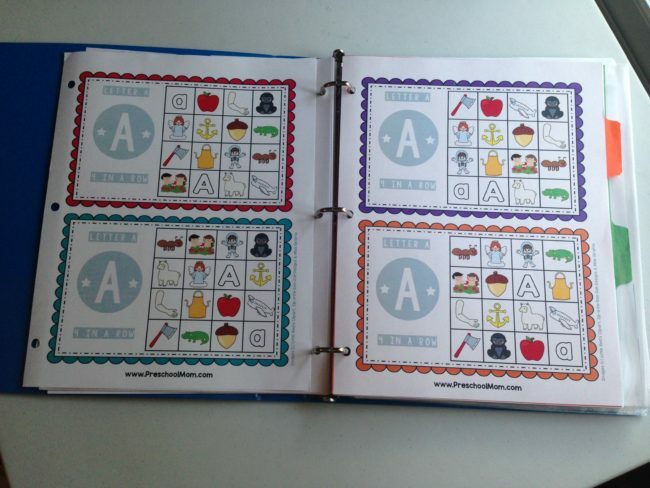 Included are lesson plans and a suggested schedule and 24 activities for every letter of the alphabet. You are encouraged to complete 1 letter per week for 26 weeks. The 24 pages of activities include: letter pages, Bible activities, games, worksheets, charts, coloring pages, math explorations, copy work, and more. 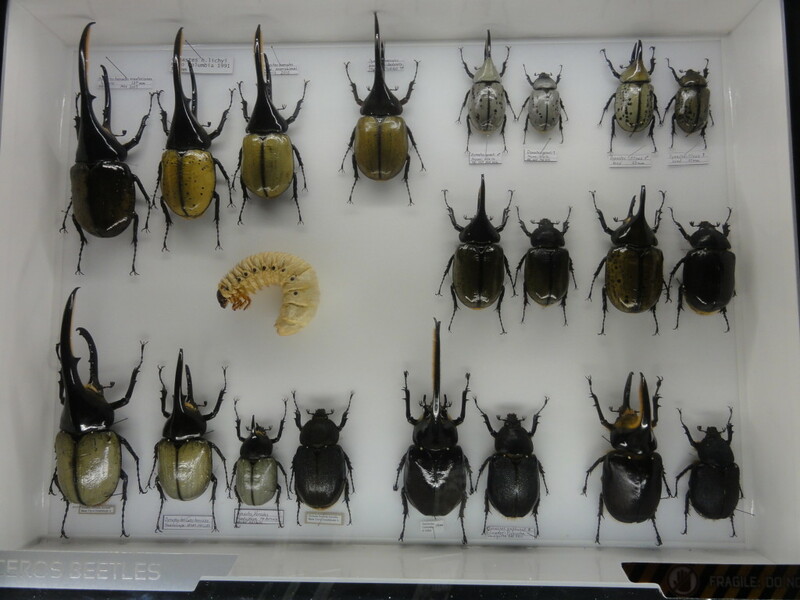 This curriculum is flexible and you can fit it into many scenarios for your student. They suggest that you plan a work schedule of 4 days a week, working on 1 letter per week for 26 weeks. The curriculum includes a handy reference Suggested Calendar & Sample Schedule. I can’t believe how quickly my youngest son is growing. It seems like yesterday he was still a little guy. I am so thankful for this opportunity to review this curriculum because it fit perfectly for our family. 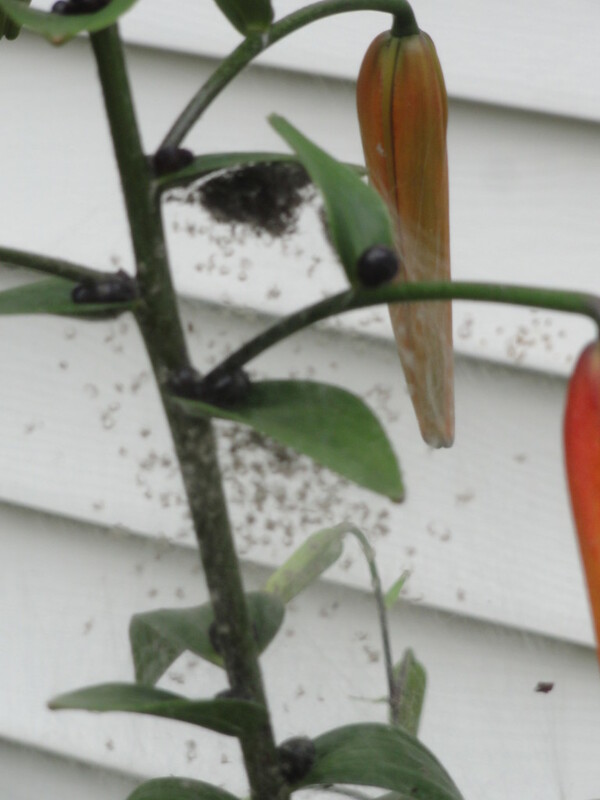 Life is busy with 6 kids in the house. With this curriculum, all the prep work is done and we can just pull out what we need each day and do it. He is progressing very well through this preschool curriculum and I think he will be ready for kindergarten curriculum this fall. He is so excited about his Bible ABC Curriculum Notebook. We are currently working on the letter F and he asks to do his school work each and every day since we started! He loves learning! I thought I would show you what a week with this curriculum looks like. Each week follows basically the same routine. Below is what the first week learning the letter A and following the schedule laid out in the curriculum looked like in our home. Character of God: Discuss the weekly theme, memory verse and vocabulary that are all related to an important character quality of God. Pray together and thank God for being our CREATOR! Beginning Letter Bible Coloring: Color the upper and lowercase letter A beginning letter picture and word to color. 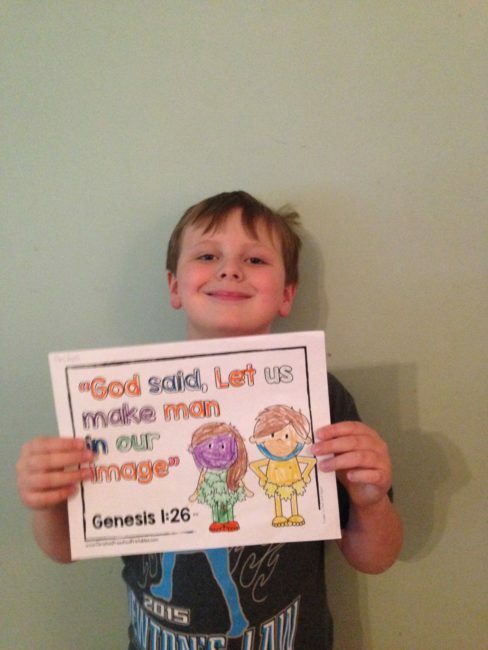 While my son colors, I can read the corresponding Bible story and discuss the weekly theme. are shown to provide ample practice opportunity. 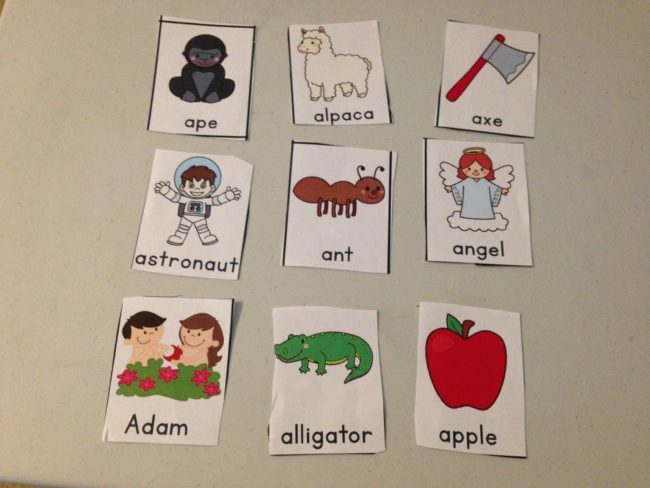 Beginning Letter Chart: Shows children 10 different beginning letter words. Hang it on a wall or place on the front of your binder for a frequent reminder during the week. 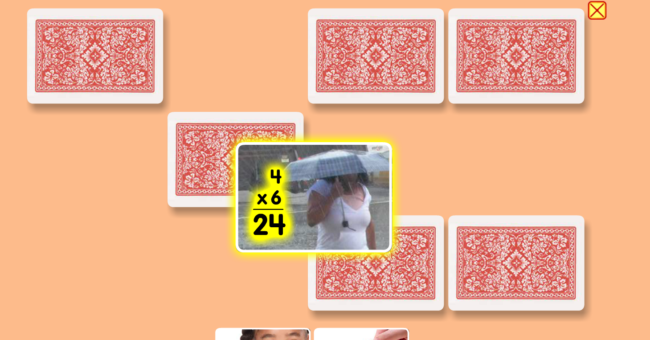 You can also play games like tic-tac-toe, print two for a matching game, etc. work on memorizing for the week. 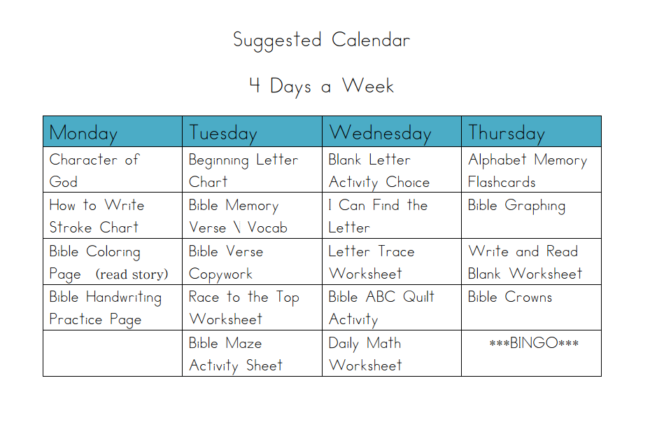 Review the verse with your child throughout the week. handwriting tracing page for the weekly verse. small motor control art activities. Blank Letter Pages: Large letters that can be put into a plastic sleeve or laminated and the design can be filled in with pompoms, buttons, sticks, play dough, stamps, designs, stickers, or things that start with that letter. I Can Find the Letter: Find the letter A and count the upper and lowercase letters. letters. 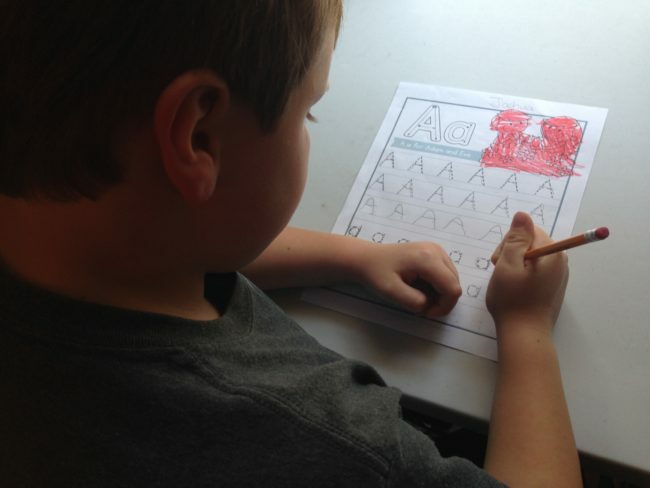 They can also make their own letters and color in a beginning letter picture for each row they complete. and lowercase letter A, then glue the letters onto the quilt square. Place the quilt square on a wall (or a string, or notebook, or place of your choosing) as they learn each new letter throughout the curriculum. Alphabet Memory Flashcards: Cut out the flashcards and use them in multiple ways: pocket chart, play a game of concentration, play sorting games, ABC order, letter sounds, etc. 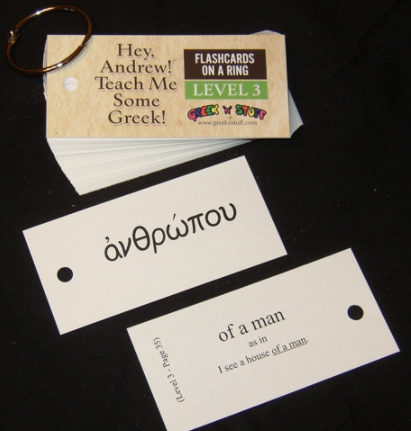 You can make several sets of these flash cards and use them in games such as matching or go fish. My son really enjoys making and using the flash cards. Daily Math Worksheet: Complete the daily math worksheet. Skills practiced include: Counting, Measuring, Addition,Tally Marks, Patterns, Ordinal Numbers, Positional Words, Number Line, etc. 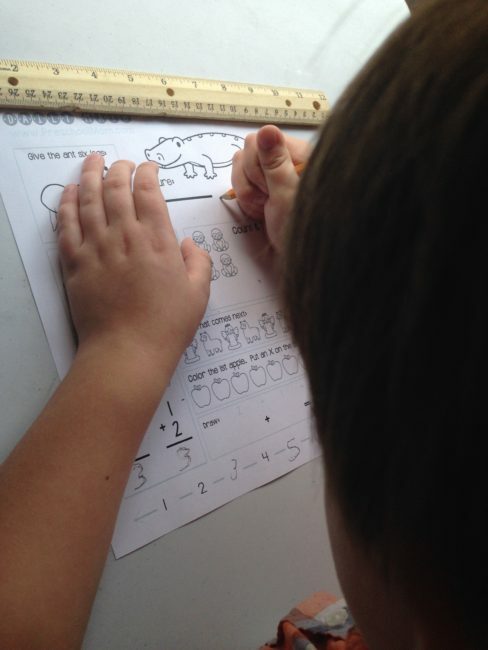 Count & Graph Worksheets: Count the letters and pictures and then graph them. 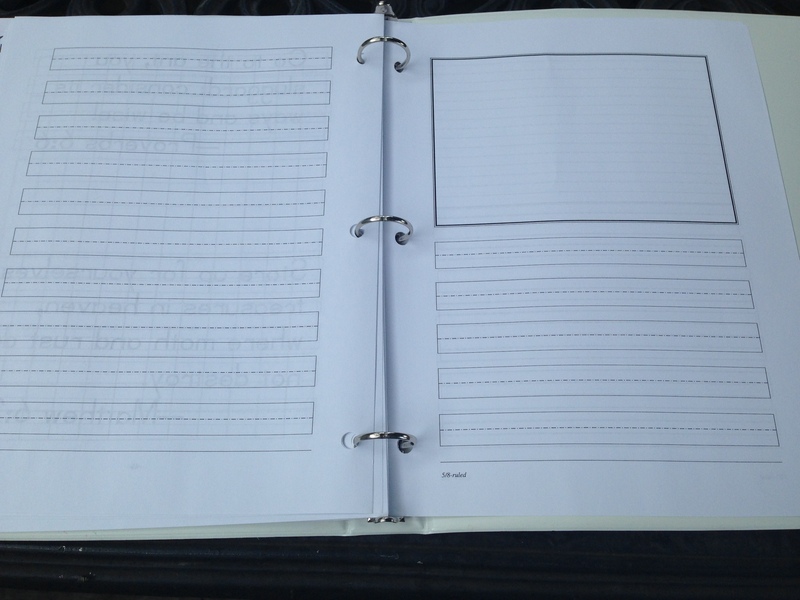 Write & Read Worksheets: Tracing page. Fill in the missing beginning letter. Bible Crowns: Color your crown. Decorate it and cut it out. 4 in a Row Bingo: Play “Letter A” BINGO. The bingo games at the end of each week are a lot of fun and a great way to review his letter. 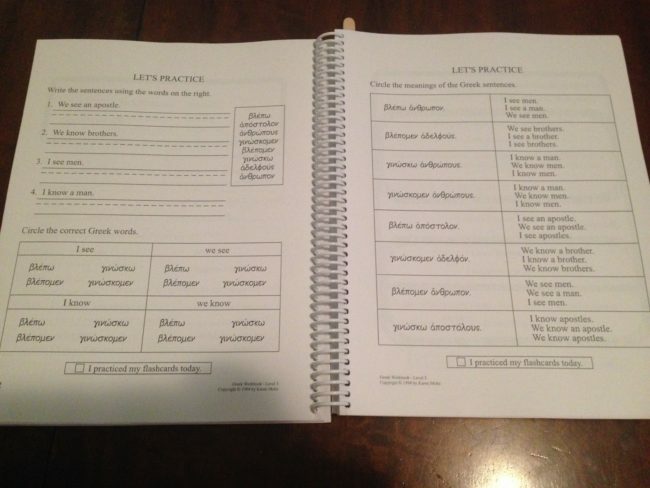 I am thankful this curriculum is easy to print and go! 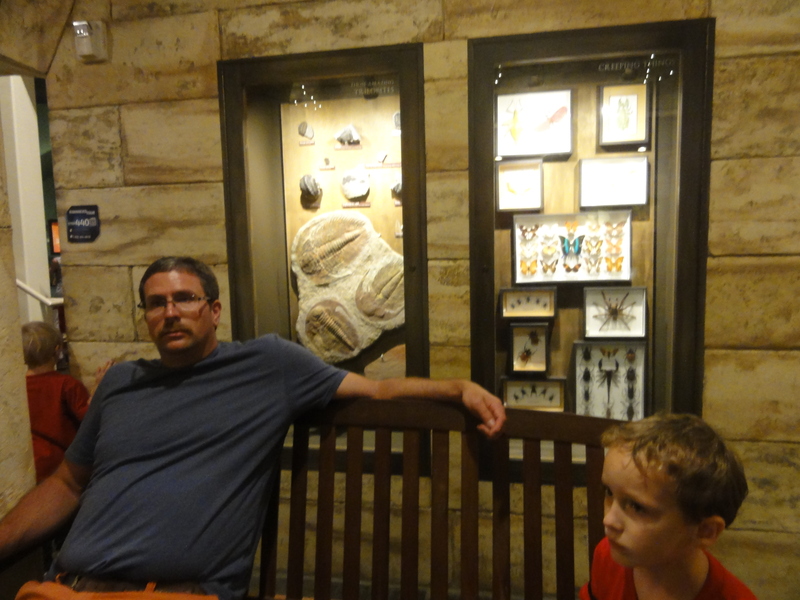 I am also thankful my son loves learning with it and we enjoy doing it together. 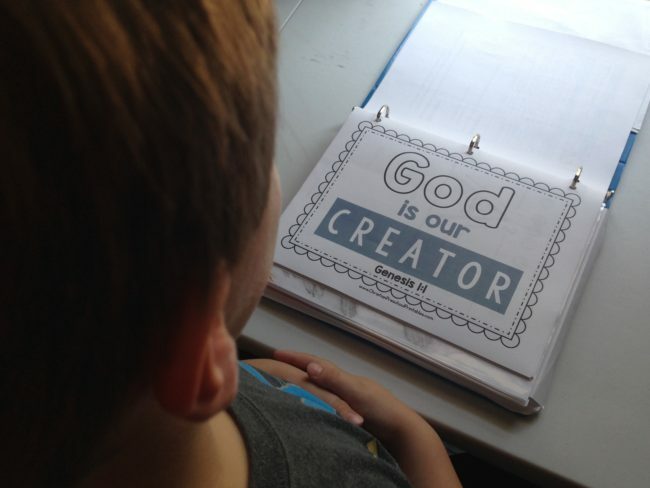 But my favorite part of this curriculum is the focus on the character of God and the verses that help my son learn about his Heavenly Father. I also love that is it so flexible and easy to use. You can use this curriculum as your main curriculum four days a week, or use it as a supplement to your main curriculum. You can print out all of it, or print out just the portions you are interested in. Being able to print only what you need is especially nice if you are working on remedial work with an older child who doesn’t necessarily need everything but does need practice in some areas. My suggestion is to use this curriculum as your framework. The lesson plans are already done for you and the curriculum covers all the basics your little ones need to build a good foundation in learning the alphabet and letter sounds as well as identifying beginning letters with associated pictures. 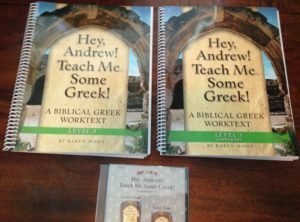 It also teaches kids basic understanding of who their heavenly father is, and how to go to his word, the bible, to read about him and build their understanding. Then if time permits, and you want to expand on this curriculum, feel free to use additional props like play dough, sensory activities, sensory bins, related snacks, correlate reading books into the theme, songs, videos, or additional crafts that relate to your letter of the week. I love it that this curriculum is so flexible, yet simple, and can be adapted to any family’s needs and schedule. R.E.A.D. Review Pack (28 Early Readers that Correspond with R.E.A.D. Notebook) Can be used as a stand-alone product, if you are not wanting a full curriculum. Check out social media links for all of the latest news and product updates. 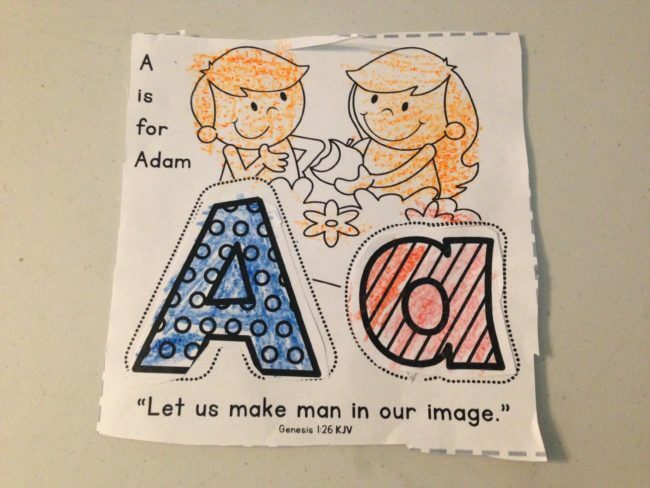 This entry was posted in Bible ABC Curriculum Notebook, The Crafty Classroom, TOS Crew Reviews and tagged Alphabet Notebook, Beginning Readers, Bible ABC Memory Verse Learn to Read, Bible Letter of the Week, Christian Preschool Curriculum, kindergarten, Kindergarten Reading Curriculum, Letter of the Week, phonics, Phonics Readers, Preschool Curriculum, Printable Early Readers, Word Families on July 26, 2017 by Melinda Weiser.